Odasoft has followed up its multi-million downloaded Catcha Mouse with Catcha Mouse 2. The new $1 game, which introduces more levels and a new multiplayer mode, is a sequel that compares favorably to the original. It’s A Trap: Just like in the original, you’re trying to corner a mouse with traps or—if you’re using the new multiplayer mode—trying to move him to safety. As with the original Catcha Mouse—still available from the App Store as a free game for the iPhone and iPod touch—the objectives of Catcha Mouse 2 are simple. You must corner a mouse by laying down traps to prevent the wily critter from escaping through holes in the playing field. You and the mouse alternate moves until either you’ve trapped it or it has escaped. Catcha Mouse 2 features more than 200 levels spread across three levels of difficulty, compared to 100 levels in the original Catcha Mouse. Version 2 also rolls out a multiplayer mode—you can play against a friend over Wi-Fi, with one player taking the part of the mouse while the other lays down the traps. 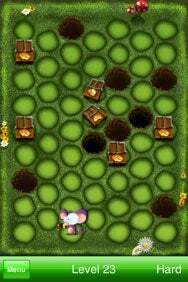 Catcha Mouse 2 brings together beautifully drawn backgrounds, adorable animations, and cute sound effects. The simple premise with increasing levels of difficulty makes for an addictive game perfect for a idle moments on the go. While the new Multiplayer mode lets you enjoy the game with a friend, it’s worth noting that each level is designed for the mouse to lose when played properly. So if you’re the mouse, the odds are against you. For this reason, multiplayer might be best enjoyed by younger gamers. That said, at $1, Catcha Mouse 2 is an excellent value and a fun addition to your iPhone or iPod touch. Catcha Mouse 2 is compatible with any iPhone or iPod touch running the iPhone 2.x software update.